This slow-cooker stew recipe is made with a combination of stew beef and chicken thighs. It's a meaty stew with potatoes, carrots, and loads of flavor. The secret to the heightened flavor is a few tablespoons of steak sauce. Chicken thighs are excellent in slow-cooked dishes and they add so much to the texture and flavor of this stew. Use boneless chicken thighs and cut them up before they go into the pot. There's not a lot of liquid added to this stew but, by the time it's finished, there should be more than enough. Even when cooked on high, there should be plenty of liquid in the end. 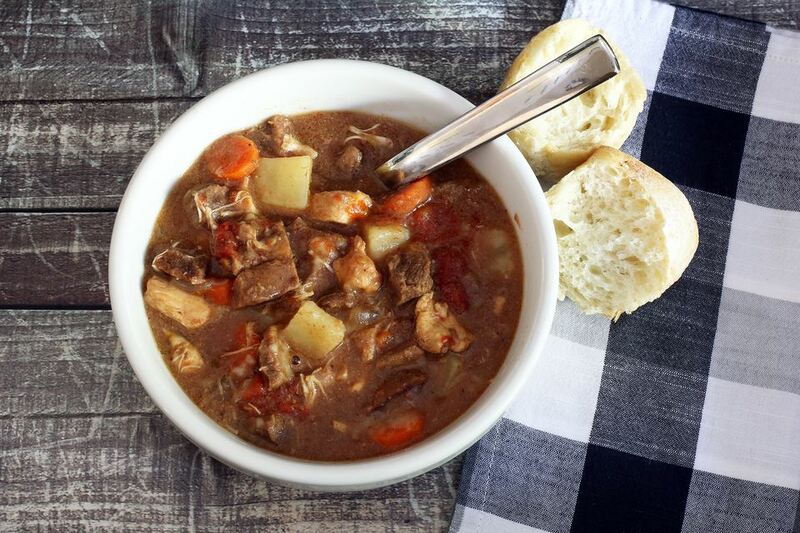 This stew is reminiscent of a Kentucky burgoo because it's made with two kinds of meat. Burgoo is typically made with a combination of chicken, pork, lamb, or beef. Combine the steak sauce, bouillon cubes, salt, pepper, sugar, and hot water in a slow cooker. Stir to blend the ingredients. Add the chicken thighs, beef, onion, potatoes, carrots, and tomatoes. Stir gently. Cover and cook on low for 8 to 10 hours or on high for about 5 hours. About halfway through the cooking time, remove the chicken thighs. Chop them and return the chopped meat to the slow cooker. Stir well and finish cooking. To thicken the gravy, make a smooth paste with the flour and 1/4 cup of cold water. Stir the flour mixture into the stew in the slow cooker. Cover and cook on high for about 15 to 20 minutes longer, or until thickened. Serve with biscuits, cornbread, or crusty bread.